Having just returned from a most interesting innovation studies conference in Beijing last weekend the article in today's English edition of The Hankyoreh newspaper naturally drew my attention. 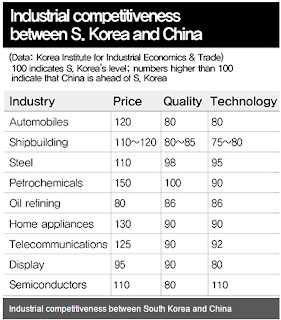 It relates to a recurrent topic of this blog, the increasing competition Korea's ICT sector is facing from China. 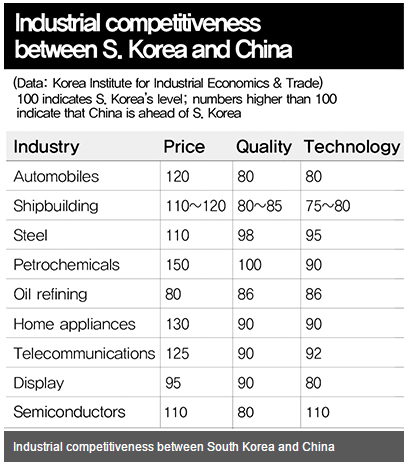 As reported in the article and illustrated by the accompanying table (click for a full size version), Korea's industries are increasingly "feeling the heat" of competition from China. What is most interesting about the table to me is the status of the last three industry sectors listed, namely telecommunications, display and semiconductors. Given their role as key components of today's rapidly advancing digital networks, they have long since become the central engine of Korea's export-led economy. Virtually all the other industries, starting with automobiles, shipbuilding and steel, are subject to the forces of digital convergence and are striving to increase their efficiency and competitiveness accordingly.